Chris Deverill sculptor, Chris Deverill animal sculptures, Chris Deverill bronze sculptures. Nature has always been important to Chris Deverill. He’s often lived next to wildlife habitats and finds it his calling to expertly capture their crazy personalities in his animal sculptures. Chris Deverill grew up in Hawaii and resided for years in both Alaska and Colorado; his earlier career took him all over the globe. Always, his love of art, particularly bronze, steered him to world-class art shows and to pieces he loved enough to collect. And the great outdoors continually called to him. In Alaska Deverill became an accomplished nature photographer with many awards to his credit. He also raised sled dogs and, in 1982, ran the Iditarod Sled Dog Race. 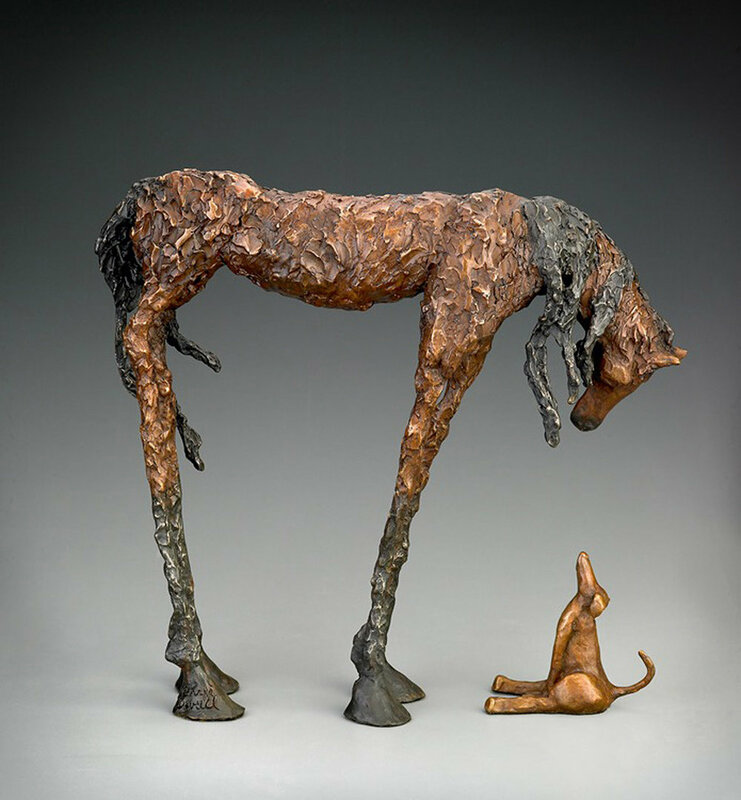 It was only later in life that Chris Deverill began to create his own body of works in bronze. Creatures of nature became a dominant subject of his. Deverill’s engaging, full of heart personality led him to re-imagine his animals in elongated, eclectic forms –capturing the mischief and emotion, curiosity and humor that animals so purely display. Chris Deverill works in his home studio most every day – usually with music cranked up high. Generally, several pieces are in the works at once or he at least has several more in mind. From start of the armature and clay sculpture to completion of the entire bronze process, a piece can take four months to complete, depending on size. And size is another factor in the beguiling pieces by Chris Deverill: They can range from table-top size to seven feet tall! Chris Deverill is a member of the National Sculpture Society and the International Sculpture Center.